"Now that technology enables us to rebuild the library of Alexandria, the law gets in the way. And it doesn’t get in the way for any useful copyright purpose, for the purpose of copyright is to enable the commercial market that spreads culture. No, we are talking about culture after it has lived its commercial life. In this context, copyright is serving no purpose at all related to the spread of knowledge. In this context, copyright is not an engine of free expression. Copyright is a brake." Lessig is suspicious of the utility of the defence of fair use, and other internal copyright doctrines, in safeguarding the freedom of expression. He objects: ‘Fair use in America simply means the right to hire a lawyer to defend your right to create.’ Lessig has maintained that the judiciary should read down the congressional power to make laws ‘to promote the Progress of Science and useful Arts, by securing for limited Times to Authors and Inventors the exclusive Right to their respective Writings and Discoveries’. He has also called for intellectual property laws to be subject to greater oversight under the First Amendment. However, the Supreme Court of the United States has rebuffed the claims of Lessig that the Sonny Bono Copyright Term Extension Act 1998 (US) was unconstitutional. This review essay considers a number of exemplars of the recent genre of publishing on intellectual property and freedom of expression. First, it examines the popular screed, Freedom of Expression®: Overzealous Copyright Bozos and other Enemies of Creativity, by Kembrew McLeod, a music critic and a Professor of Cultural Studies from the University of Iowa. Second, it evaluates the rather more stately collection from Oxford University Press, Copyright and Free Speech: Comparative and International Analyses, edited by Jonathan Griffiths and Uma Suthersanen. Despite the superficial differences in style and tone, the two books bear close comparison. The texts are certainly testimony to a growing anxiety that the dramatic expansion of intellectual property rights is curtailing freedom of expression. 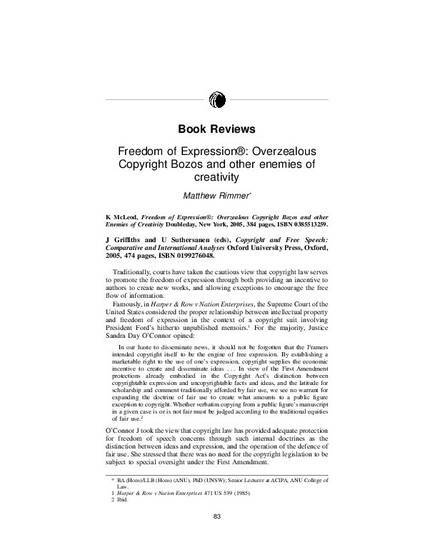 Matthew Rimmer, 'Freedom of Expression (R): Overzealous Copyright Bozos and Other Enemies of Creativity (Book Review)' (2006) 11 Media and Arts Law Review 83-94.